We’re excited to announce the publication of a new article in ACPD. This article provides new information on the roles of NOx level and RH on the formation of SOA from the photooxidation of furan in the presence of NaCl seed particles. 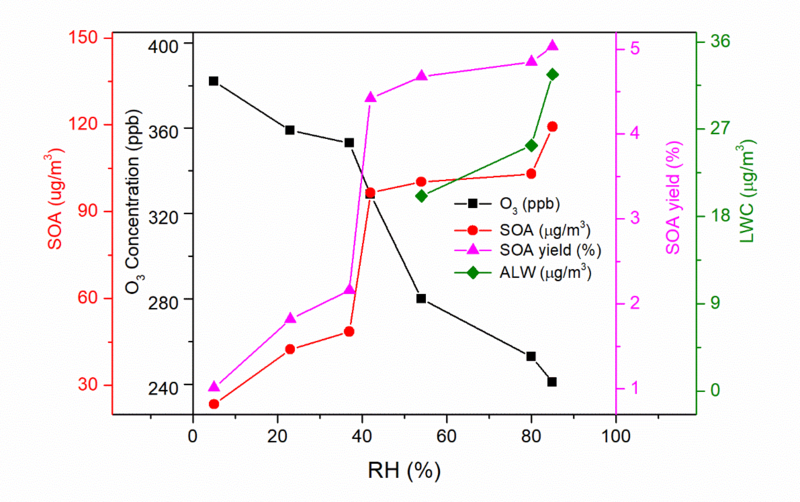 Strong evidences indicate that both the RH and different NOx levels have a significant effect on SOA formation. Dependences of maximum O3 concentration, SOA mass concentration, SOA yield and liquid water content(LWC) on relative humidity (RH). Jiang, X., Tsona, N. T., Jia, L., Liu, S. J., Xu, Y.F., and Du, L.: Secondary organic aerosol formation from photooxidation of furan: effects of NOx level and humidity, Atmos. Chem. Phys. Discuss., doi:10.5194/acp-2019-89, in review.